But the principle of liability for one’s agent is much broader, extending to acts of which the principal had no knowledge, that he had no intention to commit nor involvement in, and that he may in fact have expressly prohibited the agent from engaging in. This is the principle of respondeat superiorThe Latin term for the master-servant doctrine. (“let the master answer”) or the master-servant doctrineA doctrine under which the employer is liable for torts committed by the employee in the scope of employment., which imposes on the principal vicarious liabilityLiability incurred indirectly through the actions of another. (vicarious means “indirectly, as, by, or through a substitute”) under which the principal is responsible for acts committed by the agent within the scope of the employment (see Figure 15.2 "Principal’s Tort Liability"). In general, the broadest liability is imposed on the master in the case of tortious physical conduct by a servant, as discussed in Chapter 14 "Relationships between Principal and Agent". If the servant acted within the scope of his employment—that is, if the servant’s wrongful conduct occurred while performing his job—the master will be liable to the victim for damages unless, as we have seen, the victim was another employee, in which event the workers’ compensation system will be invoked. Vicarious tort liability is primarily a function of the employment relationship and not agency status. In the nineteenth century, a principal was rarely held liable for intentional wrongdoing by the agent if the principal did not command the act complained of. The thought was that one could never infer authority to commit a willfully wrongful act. 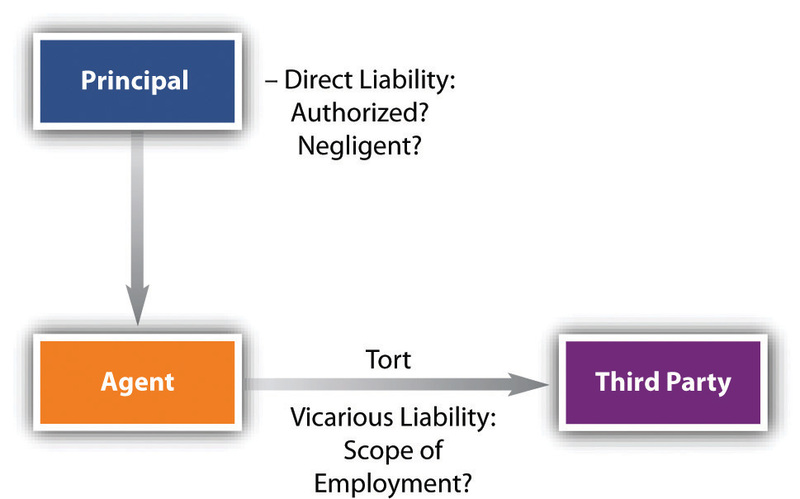 Today, liability for intentional torts is imputed to the principal if the agent is acting to further the principal’s business. See the very disturbing Lyon v. Carey in Section 15.4.2 "Employer’s Liability for Employee’s Intentional Torts: Scope of Employment".